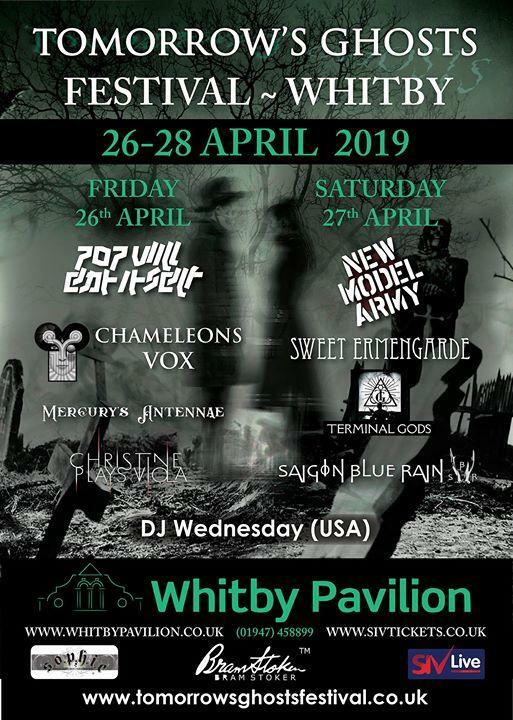 This April’s festival brings you brilliant music from POP WILL EAT ITSELF, CHAMELEONS VOX, MERCURY’S ANTENNAE, CHRISTINE PLAYS VIOLA, NEW MODEL ARMY, SWEET ERMENGARDE, SAIGON BLUE RAIN, TERMINAL GODS, MORE FILMS AND MORE THEATRE!!!!! EARLY BIRD TICKETS WILL BE AVAILABLE FROM OCTOBER’S TOMORROW’S GHOSTS FESTIVAL AND FROM SIV TICKETING FOR SEVEN DAYS….. SEE YOU THERE!!! APART FROM FANTASTIC MUSIC WE WILL BE BRINGING YOU A DAY OF ‘HAMMER HORROR’ WITH OUR ‘WOMEN OF HORROR’ DAY WITH GUESTS CAROLINE MUNRO, VALERIE LEON AND MARTINE BESTWICK TALKING ABOUT THEMSELVES AND DOING SIGNINGS AND PHOTOS. WE WILL ALSO BE LAUNCHING DACRE STOKER’S NEW BOOK ‘DRACUL’ WITH HIS FAMOUS TALK ‘STOKER ON STOKER’……..
MORE NEWS STILL TO FOLLOW!! !